This coming Friday is Halloween. Such a strange holiday when you stop and think about it. And one that Christians tend to have very strong opinions about. Some believe we shouldn’t have anything to do with it. Others think it’s just for fun so it’s not a problem. Personally, I think it’s up to each person to decide what their own convictions will be about Halloween. And I believe we shouldn’t judge others for their choice. So I’m not even going to address the right or wrong of this weird holiday. Instead, I want to remind all of you of one simple important fact – more people will be out and about in your neighborhood on Halloween than on any other day of the year. When Jesus told us to love our neighbors, I realize that He wasn’t just talking about the people who live near us. “Neighbors” are also co-workers and fellow students and people at the grocery store. But the people who actually live right around your home or condo or apartment should be at the top of your neighbor list. Do you know them? Do you even know their names? 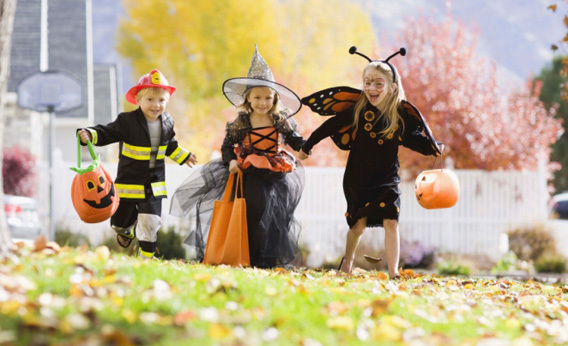 Here are some ideas for how you can take advantage of Halloween this year and use it as an opportunity to get to know some of your neighbors a little better. At the very least, turn the porch light on and greet trick-or-treaters who come to your door with a smile and candy. Invite the people on your block to stop by for a front yard hot dog barbecue before they head out trick-or-treating. Then hang around and offer the extra food – and candy – to others as they pass by. Set up a fire pit and some chairs in the front yard and provide the tools and ingredients for making s’mores. Hang out by the fire passing out candy and letting people make s’mores. This Halloween, don’t miss out on the opportunity to connect with the people who live in your neighborhood. It’s the one night of the year when you don’t have to go looking for them.